A lottery dedicated to students is giving you the chance to win £5050. 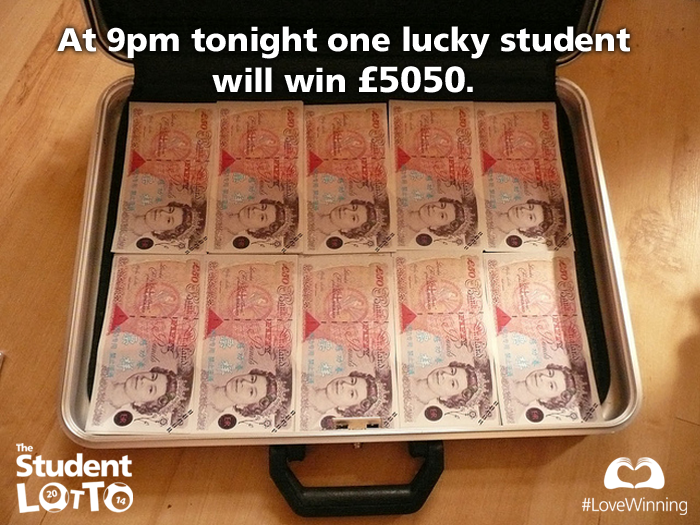 To celebrate the 50th day of the 50p Student Lotto’s 50/50 competition, one lucky student will win £5050 at 9pm this evening. Students across the UK have been winning £50 every day for the last 50 days as part of this competition, and tonight is the final prize draw. There is still time to enter. Sign up before 8.30pm for a free account or you can either like and share their Facebook page. Alternatively, play the 50p Student Lotto just once for your chance to with the jackpot this Wednesday which stands at £3.3 million. Combined with other guaranteed prizes for students such as Cinema and Festival tickets, The Student Lotto is very tempting. The winner will be announced live on Twitter at 9pm. There is much more to follow in this next month from the Student Lotto, Including their “British Summer Time Super Draw” so keep an eye out for more info. 20% of all income for Student Lotto gets donated to projects that help students in their personal lives and careers.